A New Home for Old Friends ! The fact that I am a bookworm is known to all. Books are my solace, my refuge, something I always turn to when I am feeling down. A book is pure happiness, is as essential as the air I breathe! I think books should seriously be considered as stress relievers. They are also much more effective than medicines. I believe one dose of PG Wodehouse or Ruskin bond along with your antibiotics will help you recover from your cold or stomach upset that much faster! Works for me at least! For me reading is a religion. And I honestly treat my books like minor Gods. I am not averse to sharing things usually but I am very very hesitant about sharing my books and god help you if you give me back my book with even a scratch on it. I also want my books to be accessible to me at all times. I rather fancy them as dear friends whom I can walk up to and have a pleasant conversation with at any time of the day. My time with my books is very precious to me. I like to sit quietly, leafing through them, re reading my favorite chapters and passages afresh. Till now all my books were scattered around the house. Some on tables, some in shelves, some locked inside the cupboards. I was not happy. I wanted all my books together, in one place. So I decided to indulge in a few good book shelves. After searching high and low through the city for many months, I found two fabulous book shelves in Amar Colony Antique Market. These gems were hiding behind a few tables and antique chairs and it seemed as if they were just waiting for me to spot them! I fell in love with them as soon as I saw them! Last weekend I spent a very pleasant day arranging my books in them and then proud as a peacock I put up a few pictures of the bookshelves on Facebook. And then Suranga Date of the Strewn Ashes and Gappa fame saw them and penned this lovely poem about them on the spot. I particularly like the first para. The books are so well described. Thank you Suranga ! And I hope my books will be happy in their new home ! so you do :P You'd love. And the food is great - specially the cholle Bhature ! I am so glad you found the right kind of bookshelves for you books. I fully agree with everything you've said here about books. I was nodding furiously as I read your post. I'd like to say one thing about your bookshelf. It is, in my opinion, the best eye candy. Suranga's poem is so charming. Lovely shelves , and I just loved the bars and designs on the sides. So the two set of books can look at each other :-) ... Thank you for mentioning the poem ! You bet ! More and more books. 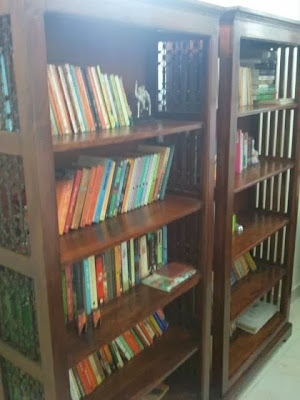 Love the bookcase and your childish enthusiasm at putting books in them. Just like you I hate lending my books and then even worse asking for them. And God help those who spoil my books. Nowadays, however I buy less books and lend them from a library. I already have two overflowing bookcases :). I am also fast running out of space. Seriously thinking of going the kindle way ! Ah! That reminds me to re-arrange my book-shelf too!!! Thank you. yes I do have some lovely friends ! Yadi ba punoragota vikrito vimordito ba. I am happy sharing books is not recommended in our scriptures as well Mrinal Uncle. This strengthens my case ! Not sure if u got my prev comment. So glad to find another Ruskin Bond lover ! I think when one experiences unparalleled joy about something, this is how it manifests itself - with a quietly euphoric post like this one. I am glad all your books are now right in front of your eyes practically ever minute of the time you are home! A Good bookshelf, better books, best friends! !